A Quick, Easy, And Cute Bun! It's always nice to have a few quick and easy hairstyle ideas on hand. And this hair tutorial (below) shows how to make the easiest bun ever! I'm loving the different textures in this style. Mixing curls with braids always seems to turn out cute. This bun would be great for many occasions: Dance, ballet, figure skating, cheerleading, sports, recitals, communions, baptisms, weddings, school, church.... any occasion really. 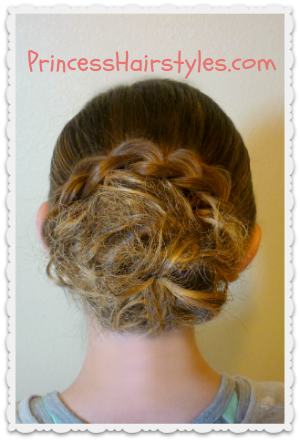 Maybe even a cute Valentine's Day Hairstyle! The best part is that it literally only takes a few minutes to complete. We love the effortless look of a messy bun, but as the princess's hair has gotten longer... making a messy bun is sometimes not so effortless! In fact, a messy bun usually takes us longer than most other types of buns (which kind of defeats the whole purpose.) So, as you will see in this tutorial, we have "cheated" just a little bit. ;) We went a different route and used a hairpiece to help form the bun! I know some people don't like the thought of using "fake hair" and it can seem a little strange if you really think about it. But, since purchasing our "hair twister" from Sally Beauty Supply, we have used it time and time again. It is just so quick and easy, looks great, is non damaging to your hair, and no one really knows it isn't your real hair anyway. The Princess and I tend to use ours a lot on mornings when our hair isn't looking so great and we don't have time to deal with it..... 9:00 A.M. church comes to mind! 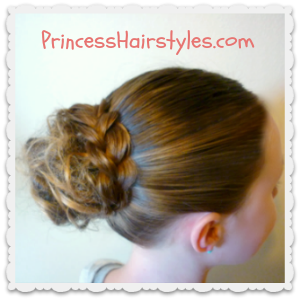 Of course, you can easily use this "fake hair" to form a standard bun or half up bun without the braid wrapped around it. We wanted to add the braid to make it a little bit more unique. We have also done this same style with a rope braid wrapped around the bun, as well as a four strand. Both variations turned out super cute. 1 hairpiece (shown in our video below.) The one we purchased came from Sally Beauty Supply and is called a "hair twister" I believe it was around $3-$4. I have also seen them at Walmart and various drug stores. I think the key to making this look as natural as possible is matching your real hair up to the hair piece as best as you can. I would recommend taking the person you are going to be using this for with you to the store when you buy it, so that you can match it closely to the natural hair color you will be working with. This hairstyle looks very beautiful and attractive. Love this.